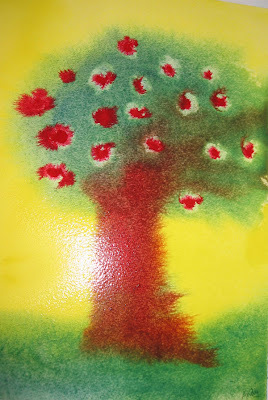 Today we painted a tree. I have mine and two of my fellow student's trees. All are beautiful, I think. 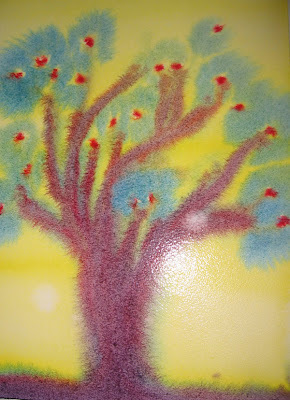 The technique is wet on wet watercolour painting, which is such a soul activity and the children at Steiner schools do a lot of these! Studying to be a Steiner teacher is like studying how to be a human being- I mean, really, when did going to school ever make me feel like I was learning how to live, how to feel, how to truly think, how to manifest with my whole being. "We must eradicate from the soul all fear and terror of what comes towards us, out of the future. We must acquire serenity in all feelings and sensations about the future. We must look forward with absolute equanimity to everything that may come. And we must think only that whatever comes is given to us by a world-directive full of wisdom. It is part of what we must learn in this age, namely, to live out of pure trust, without any security in existence - trust in the ever-present help of the spiritual world. Truly, nothing else will do if our courage is not to fail us. And let us seek the awakening from within ourselves, every morning and every evening." Anna had a stall at Ceres to sell her divine dolls and other preceious crafty peices, all proceeds going to the bushfire relief. It was such a divine day. The chickens and I went along, and we loved sitting behind the stall felting little treasures to sell. I did more robins and Chicken one accomplished four flower fairies- SOLD OUT. 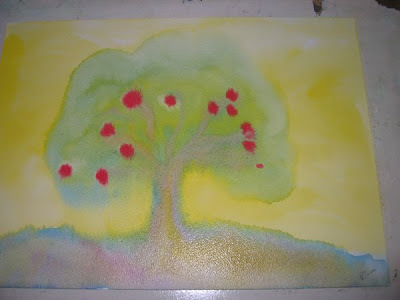 Hello there Jo, nice to see you in blog world - what gorgeous paintings - and what an inspiring blog.